Before we get into how to survive the first week with a newborn, I want to make a couple of critical points. The very first point that I want to make is that newborns are NOT easy–and that’s because of a combination of factors. It doesn’t matter what childbirth preparation class you took, or what breastfeeding manual you read. You see, these classes are usually just theory, but, you need to be in the trenches to be able to prepare for something like this. And that would be a bizarre situation if you had access to a newborn baby that you could “train” yourself with. I think it is safe to assume that the majority of us don’t have this kind of opportunity. The second important point is that you will definitely get through it. Think of some of the questionable people you know who have grown children. The ones where you aren’t really sure how their children made it into adulthood. If they can do it–you can most certainly do it. The fact that you are actually trying to prepare shows that you are at least one step ahead of those people who may be a bit more questionable. 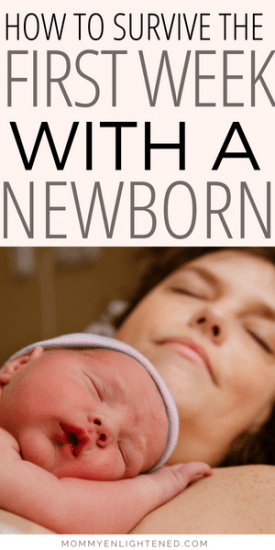 Why is the first week with a newborn so hard? If you think about it, you are going through some genuinely tough things right now. You just gave birth. Everyone’s experience with this will be different–but that’s not the point. You MADE a human, and you GAVE BIRTH to it. That’s such an amazing thing–but it is hard exhaustive work. An “easy” labor is NOT easy. It’s still something that your body will need some time and love to recover from. You are no longer pregnant. Okay, if you are pregnant, I KNOW that probably sounds pretty good right now. I think many of us continue to see it this way after giving birth. However, there are plenty of other women who feel that they are experiencing a loss when they give birth. It makes sense; you spend nine months growing something, and then it is suddenly gone. Yes, you have a real live baby in your arms, but it just feels different. This sometimes translates to feelings of loss. You have a newborn, and newborns are hard. If you have a partner, it’s likely that they are struggling too–even though they were never pregnant and didn’t have to give birth. That’s because life with a newborn is tough, and there isn’t much for it but to keep pushing ahead. You will be in a haze for the first week or two while you function on minimal sleep. There’s a steep learning curve for most people. If you have a partner, you need to have a serious discussion before baby gets here about how you will support each other. Supporting each other is making sure that you are both caring for baby, while staying considerate of each others’ needs. One of the most important things to decide is how you are going to make sure that you both sleep. If your partner works outside the home, it’s understandable that they would want their rest to be a priority. However, you are ALSO working all day taking care of a newborn, and until you recover fully from childbirth, you need sleep to help you heal. Most couples find that taking turns is the easiest way to share the load. My husband worked full time outside the home, but he was totally supportive of me getting as much rest as I needed. It’s entirely possible that there were days that he slept much less than me. I am not saying this is the best way to do it, but you need to consider your healing when deciding how you will share the burden. When you go into the doctor’s office for checkups, they will ask for how your baby has been eating, sleeping, and pooping. You can download an app for this, but if you prefer good old-fashioned paper and pen, we have a printable baby schedule tracker. 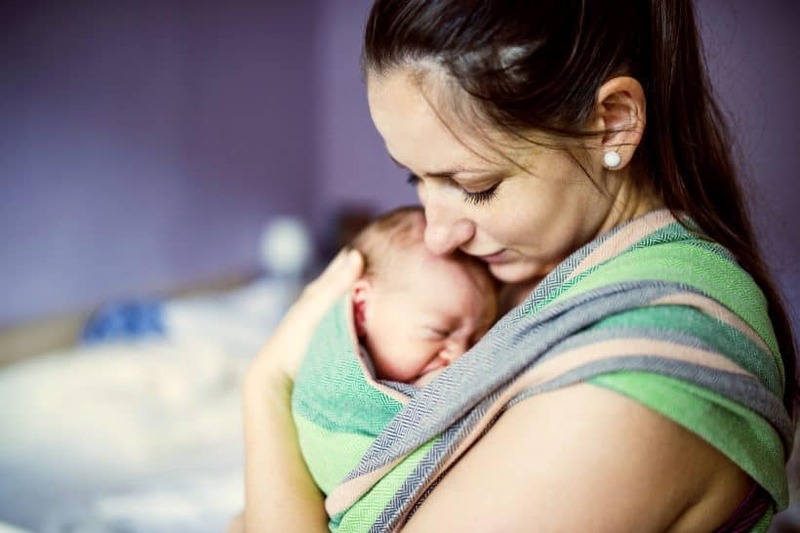 The first couple of weeks with a newborn you will probably be bombarded with offers from well-wishers who want to bring you food, clean your house, and hold your baby. As long as you are comfortable with it, and they aren’t sick with a cold–let them. Being with your baby as much as possible is very important, but so is food. If you are feeling brave enough, you can have someone care for your baby while you take a well-deserved nap. Swaddling is kind of magical because it’s so calming and most babies love it. The nurses in the hospital will likely swaddle your little one while you are there, but I don’t recommend trying to swaddle with a regular blanket unless you are really good at origami or you’ve previously done it. This was our very favorite swaddle, and we tried a few before we landed on this one. We have used it with both of our kids and they’ve done really well with it. I recommend trying to use this from day one–I promise it makes life easier for the majority of new parents. Because all babies are different, figuring out how to soothe your newborn is going to be tough. The best tip I can give regarding this is to do what you can to recreate the environment that your baby just came from. They are going through an overwhelming amount of change, so give them something they are familiar with. Rock your baby, pick up a white noise machine, hold your baby on their side, and swaddle them. Try them all at the same time and separately. There are plenty of baby hacks that will seriously make your life easier. We learn a lot when we are basically in survival mode, and you can learn a lot from other moms who have been there. Here is a video from a mom with some seriously useful info to help make life with a newborn easier. You can also check out our posts on newborn hacks. Bonding time IS important, so make sure you get it. Don’t feel guilty if you want to spend the first week alone with your baby–people will understand. If you are perfectly okay with having visitors, set a schedule. Be flexible with yourself, and plan out a couple of hours a day (more or less depending on what YOU need) to accept visitors. You will tire out pretty easily, so you definitely don’t want to jam pack your days with friends and family. Don’t be mistaken in believing that breastfeeding will come naturally to you (this MAY happen but probably not.) Breastfeeding is HARD, and it hurts for a while. Remember to push through–it’ll get more comfortable. Learn some breastfeeding hacks that will help make your life easier. Most hospitals offer a breastfeeding course, but if you would rather do something online, we highly recommend this Milkology course from Stacey, a lactation consultant. She has helped hundreds of new moms learn how to be successful with breastfeeding. KellyMom is another excellent breastfeeding resource, so I definitely recommend bookmarking her site. Make the time you will be spending in your kitchen as easy as possible. Pick up some paper plates, cups, and utensils and use those for a while–trust me, you won’t have time for dishes. Make some pre-baby freezer meals that you can throw in the oven. If you can, try to look at recipes that will be easy to eat while holding a newborn. Trying to eat a messy lasagna while juggling a newborn is asking for trouble! Write what daily tasks need doing during your recovery on a whiteboard. These could be as simple as taking out the garbage or doing the dishes. When you do have visitors, and they ask how they can help (because they will), ask them to choose something off of the list. This way you don’t need to feel guilty for assigning tasks to your visitors, but you can still get the help you truly need. You don’t want to start rocking or feeding your baby without everything you need within your reach–you don’t know how long you will be stuck there. I can’t tell you HOW many times I had finally gotten our baby to sleep and I literally didn’t move for over an hour. I didn’t like falling asleep while holding our baby, so I kept my water, a couple of snacks, and my phone nearby so I would stay awake. If you are a person that tends to put a lot of pressure on yourself–trust me, I get it. Cut yourself some slack during the first couple of weeks until you are more yourself. Remind yourself that your baby will only be this little once, and those dishes aren’t going anywhere. There are some moms who don’t believe this is possible. Short naps don’t really work for me, but I have plenty of mom friends who swore that napping with the baby was the only way to get some actual sleep. You are not going to get your typical eight hours of sleep. You just won’t. Breaking up your sleep into short stints like that are not optimal, but it’s one of the best options you have. Once you lay baby down, lay down yourself and take a nap. This is definitely preferable to no sleep at all. A sitz bath is a therapeutic warm water bath that sometimes contains different herbs. The tub only needs to be about 3 inches deep (enough to cover your hips), but you can also buy a fancy over-the-toilet sitz bath if you want. Mommy on Purpose recommends using lavender oils and Epsom Salts in her extensive article on postpartum sitz baths, but you can find plenty of other things to add to your concoction by a simple search on the web. Make sure you check with your doctor before taking a sitz bath, as it may not be safe for all postpartum women. You don’t want to have to stop in the middle of a bathroom diaper change to get the wipes out of the nursery. Pick up some small storage containers (these are cute) to keep in each room. Add diapers, wipes, and some diaper cream in each one. If you have extras, you could always add a small blanket and a onesie, but that may be overkill. This is going to look different for everyone. If you need a shower to feel human, make time for it daily. If you value your alone time, steal a few minutes to yourself while baby is sleeping. Your little one will be okay if you leave the room for a few. Just practice common sense and move them to a safe space and keep them within earshot. You need to take care of yourself if you are going to be taking care of another human mama. Remember, the first few weeks are just as hard for them as it is for you. I found the best thing I could do during those really hard moments was to remind myself that this was temporary. While remembering that is comforting in the moment, it’s also a little sad because your baby will only be this little once. Take care of their basic needs, give them love, and embrace it. What are some of your best survival tips for the first week with a newborn? What was your biggest struggle? I would LOVE to hear your thoughts, so feel free to leave me a comment below. If you enjoyed this post, please pin it and share with your friends! This is one of the best lists I’ve seen for handling life after bringing home a baby. These are super great ideas that would definitely make those first days a little easier! Thank you for sharing!